Arranger Sally Herbert (second from left) playing in London's AIR studios at a string-quartet session. 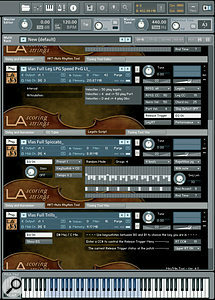 Countless musical productions in all sorts of genres have benefitted from the addition of brass, woodwind or strings, and in almost every case a skilled arranger or orchestrator will have taken the ideas of the composer or producer and transformed them into a score that musicians can work with quickly and efficiently. 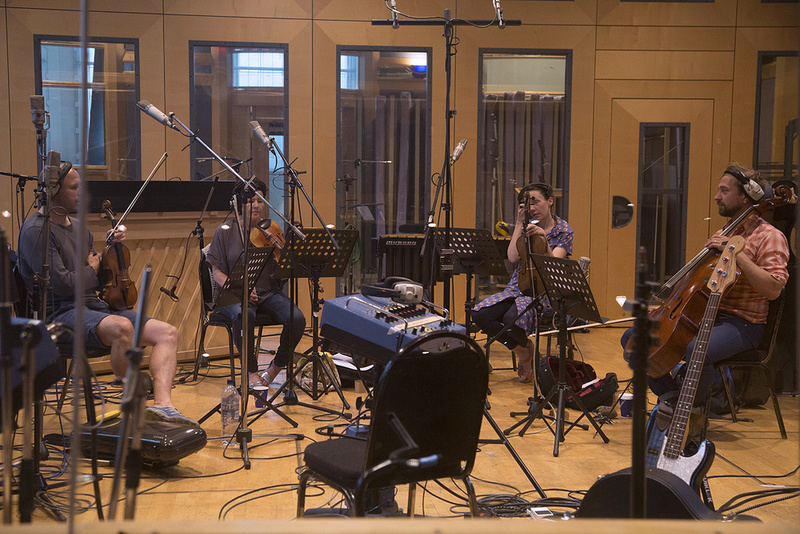 It’s also very common for the arranger to conduct the recording session, and on other occasions the arranger may act as a sub-producer, overseeing proceedings from the control room and tweaking the arrangement on-site to better fit the other elements in the mix. To help give you a better understanding of what it’s like to work with these skilled professionals, I spoke with two leading arrangers, Sally Herbert and Nick Ingman — you can find out more about them in the ‘Meet The Experts’ box. I asked them to reveal how they turn a composer’s ideas into orchestral scores, and to describe the type of material a composer should, ideally, provide an arranger with. Obviously, an arranger has to be given a composition before they can start work, but the material that they receive varies hugely from job to job. Nick and Sally have experienced it all, from the very good to the extremely bad. So if you want string, woodwind or brass parts and you’re not musically literate, how best can you communicate your ideas to an arranger? On some occasions the arranger is not given MIDI or audio, but the name of a piece of music to use as an example of what’s required. “I’ll often have someone describing a song or album they are influenced by, which is quite a good clue as to what style they want the strings or brass to sound like,” says Sally. “I like to know what they have in mind but I’m happy for them to tell me in words. If they give me a few string ideas that’s fine, but I’m usually happy to hear about influences or styles. If they say ‘We want a big tune here,’ or ‘we want something to give a bit of texture to the chorus,’ that’s usually gives me enough of a clue to get it right. It’s clear from what Sally and Nick say that arrangers and orchestrators are usually prepared to work with most briefs, no matter how vague they may be, but they have clear recommendations to offer those composers who are willing to supply an arranger with high-quality source material. “You need to provide a demo of your song,” begins Sally, “and if you have a guide string or brass part, you can have one version with it on, and one without, for the arranger to work on. It’s useful to give a MIDI version of what you have played so the arranger doesn’t have to decipher what it is. It can be quite tricky to work out what someone has put into a track on a fake string or brass sound, because it can get mixed up in guitars and other things. “Give guidelines, but keep the idea simple. If there’s a theme you want the orchestra to play, put that in, but don’t take it too far or overcomplicate it. Leave it to the people who are used to doing it. “If you can’t afford an orchestra or a strings section, which most bands can’t, you can sometimes find players who will help you out, but,” she advises, “keep it really simple again, and use the strings or the brass more texturally to bring out one line. Don’t try to create a masterpiece if you are not sure what you’re doing! And if you are producing a manuscript, ask the players for advice. You may think that it looks all right in Logic but it’s always worth asking someone if it is readable and in the right clef. 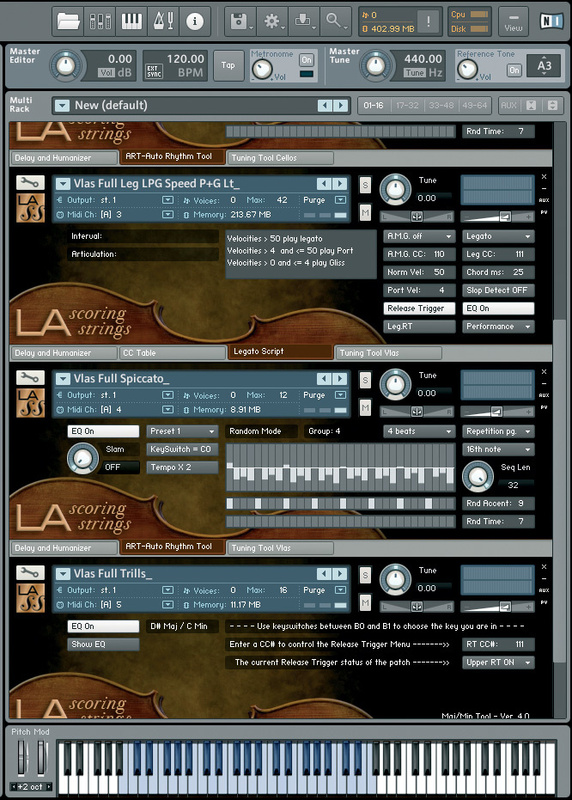 The scoring facilities built into DAWs such as Logic might be all you need to produce a score for basic pop/rock arrangements, if not for more complex classical styles. But remember that the MIDI information required to play some virtual string or brass instruments is very different from what’s needed to generate a score that musicians can follow. “A lot of bands say they’ve done the scores, but when you get there you find the violin in the bass clef and they haven’t realised that violas play in a different clef to violins. Or they have played it on a keyboard without quantising and just printed it out. MIDI files can be confusing when not quantised. Even if it sounds alright as MIDI, the score can be unreadable, and if you are asking people for favours that doesn’t go down so well! 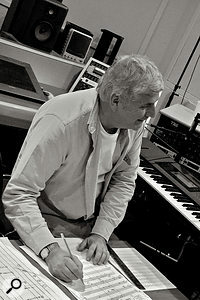 “Logic is fine for scoring a small section like a quartet but I do quite a lot of classical crossover for people like Sarah Brightman and Catherine Jenkins, and it’s pretty awful for things like that, so I get an arranger called Olli Cunningham, who works with me occasionally, to put it into Sibelius and then we make a clearer set of parts. That’s important because often those artists will take that on tour. I literally print out my Logic score, write notes on it, scan it back, and give that to him. 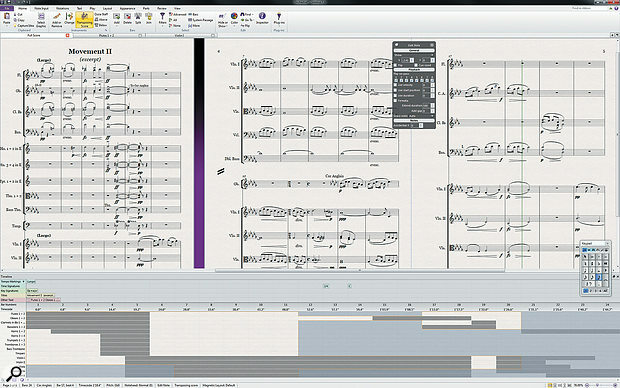 When presented with a basic score from DAWs such as Logic or Cubase, an arranger might make manual annotations, and have someone turn their scrawls into a tidy score using a dedicated application such as Avid’s Sibelius. 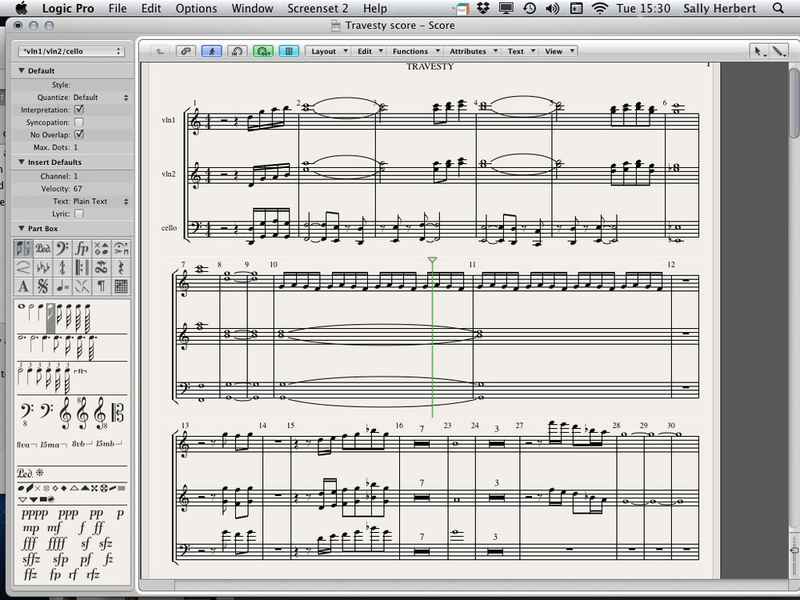 Avid Sibelius. 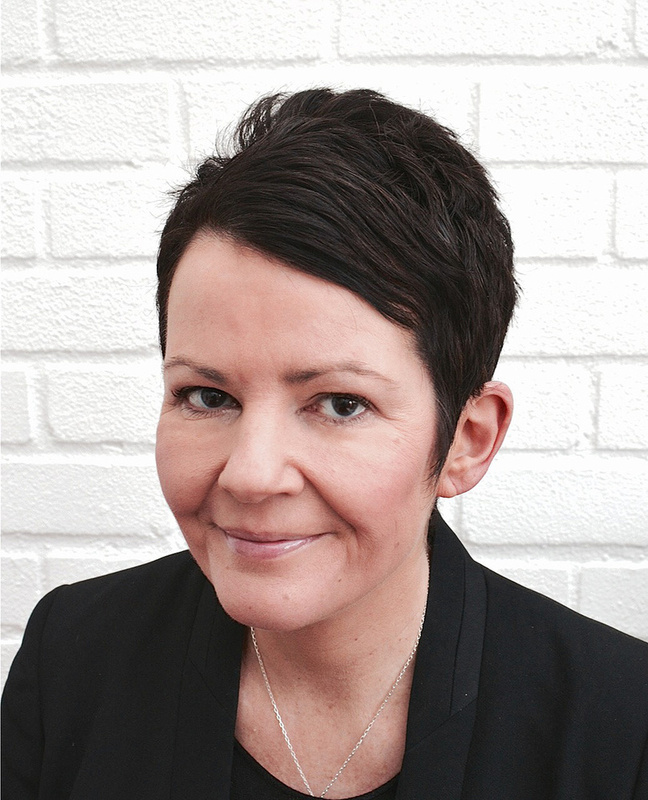 Sally also has some advice for anyone wanting to avoid paying for a commercial studio. “I’d rather not try to record strings in someone’s bedroom because the acoustics can be a problem. If you haven’t got an AIR Studios or an Abbey Road, where the instruments sound glorious whatever you do, you sometimes pick up horrible frequencies, particularly with strings, so it’s probably better if it is acoustically dead — you can add the reverb later. You also need space. If it’s just one violin or cello you don’t need much, but if you have a quartet sitting down with four music stands and four chairs it takes up more room than you might think! Nick asserts that the arranger’s skill is to take whatever they’re given and make it work, and he says that he is always keen to receive instrument or group stems along with the main mix so he can properly analyse the material and match his score. “It’s always helpful to have stems because then I can really get into the track and find out what’s happening in each bar,” he explains. “If the bassist is playing sevenths in the chord, for example, that could be interesting, but that’s sometimes hard to hear when you get the whole track. “If I am adding a string section which has a bass part, I’ll want it to play along with the synth or electric bass and I need to be very precise so that the harmonic structure and the rhythm are correct. But I’m also listening out for mistakes! That’s always interesting because if the bass player wasn’t absolutely on it you have two options. You can go back to the producer and say ‘Do you really mean that in bar seven where he is playing an A and the band is playing a B chord?’ He may say ‘Yeah, it’s fine, what’s your problem?’ In that case then you go with the ‘mistake’, and you make a meal of it. Unless it’s really catastrophic, you have to underline it and make an issue of it, otherwise it gets lost in the undergrowth and sounds wrong. “There are thousands of instances where there are ‘wrong notes’ in a pop tracks, particularly where people are singing a note that’s not in the chord, and often the track is massively interesting and successful, so the rules go out the window. You have to make a judgement as to whether it is interesting or just a mistake. Although orchestral arrangements tend to be added to pre-recorded productions, the arranger often has to be ready to alter their work when there are late changes to the mix or basic arrangement. 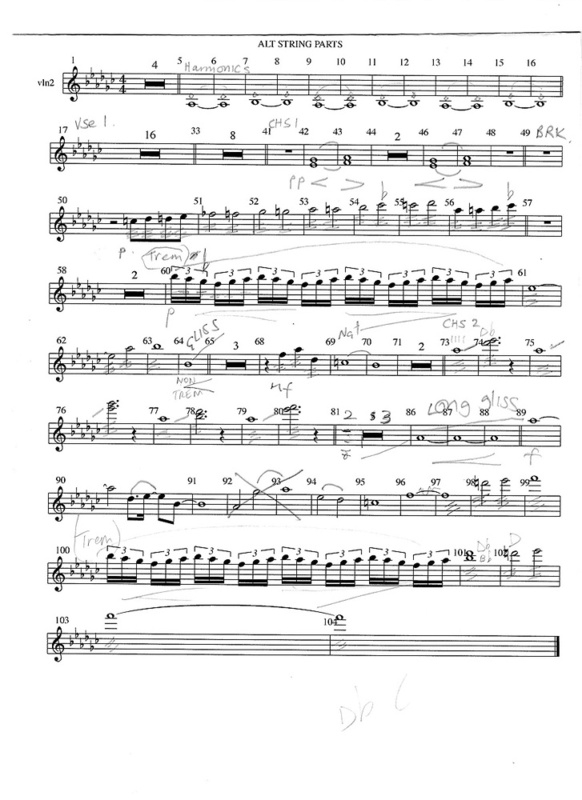 Sometimes the arranger gets asked to write the score with reference to a demo, only to find that by the time they start recording the orchestral parts, the track has moved on! Needless to say, it is better to keep the arranger in the loop and indicate, if possible, whether or not the track is finished or in a state of development. “Pop is difficult because it is a work in progress until it becomes a record,” confirms Nick. “It’s being constantly tampered with because that’s how it works, but when I come in I need to know where they are in the timeframe. Often, they are not finished and you have to keep going back to them, so when you finally get in the studio you are not surprised to find the track is in a different key or tempo! Sally’s solution to the vagaries of pop production is to work with a regular group of players, who are capable of adapting to changes very quickly and improvising when necessary. During a typical recording session, she is apt to consult her players to ensure she is getting the best possible results from them, and this is especially true when tweaks and changes are being made. “If you have a quartet,” she explains, “then that’s small enough to discuss what you are going to do, and I always take on board the ideas of others, but I don’t encourage it in a much bigger section,” she continues, ”because if everyone has an idea it’s time consuming. For a bigger section you’ll have the leader. There is a guy I work with a lot called Everton Nelson, and quite often we’ll discuss the part and he becomes the mouthpiece for the section. Or the lead cellist will come into the control room and we’ll listen to the recording, so you have three or four people with ideas. If the arranger is also playing on the session, then that adds a layer of complexity. “If it’s a big orchestra,” Sally continues, “I’ll be conducting, or I will be in the control room listening, but sometimes when it’s a string quartet I’ll be playing the violin and I’ll be going in and out of the control room all the time, because you have a very different balance through the headphones in the live room and you have to hear how it is sitting in a track... You might have the drums loud in your headphones if it’s a rhythmic part, but the track will be fairly quiet and the likelihood is that the vocals will be low because vocals can interrupt the tuning. When you are trying to concentrate on tuning you need to listen to, say, the piano or acoustic guitar. The voice or an electric guitar that’s moving about a lot can be really off-putting. So you need to hear how it is sitting when the vocal or the guitar is up, and make sure the tuning is working and not interrupting the vocal. The modern arranger is multi-skilled, flexible and creative, which is great news for composers, producers and artists who want orchestral instruments on their tracks. Even if your idea is sketchy, the arranger should be able to develop it to fit the track, adapt the score to changes made in the studio, and instruct musicians accordingly. 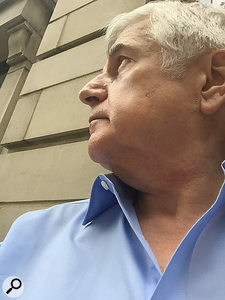 Ultimately, though, the composer must understand what an arranger will and won’t do, and be able to provide them with suitable material to work from. 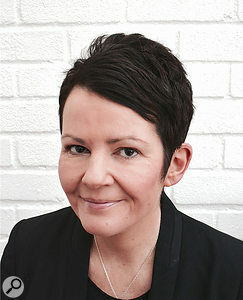 Sally HerbertSally Herbert was classically trained at the Guildhall School of Music, but in her final year she landed a job in a quartet touring with the Communards, and decided that working in pop was more fun than following the classical route. After a brief stint as one half of the pop duo The Bandaras, she found herself arranging for producer Mike Hedges. “I was doing sessions as a violinist for Mike at a time when the Manic Street Preachers were recording ‘A Design For Life’ and there were lots of big-sounding tracks about,” explains Sally. “One day, his arranger didn’t turn up and he asked me if I wanted to do an arrangement. That was it and I started building a career and meeting other producers and bands. Nick IngmanArranger and conductor Nick Ingman studied under jazz composer Graham Collier before following in his mentor’s footsteps and heading to Berklee College of Music in the United States. When he returned to the UK he landed a job working for producer Norrie Paramor, alongside Tim Rice. “That was a massive learning curve,” says Nick. “I started to do arrangements when Norrie was too busy to do his own and when he was preparing to retire he handed over all the arranging and conducting to me. In those days, it was bottom-up arranging — in other words, the full score including drums, bass, guitar, strings and brass, and everything was played together in one room. The big rooms like Abbey Road were the main studios, and it would be 40 to 60 people recording four tracks in a three-hour session, complete from top to bottom. It was a huge discipline on everyone’s part, and the performances had to be absolutely flawless first time. All these huge names like Jimmy Page and Jim Sullivan were just jobbing musicians and would come in and do sessions. “As an arranger, I had to know all the instruments, their ranges and what sounded best — you are a multi-instrumentalist, even if you are not actually playing stuff! One of the good things they did at Berklee was make you learn to play the C major scale on every traditional instrument, so you had a working knowledge of pretty well everything. Anyone intending to add orchestral arrangements to their recordings needs to consider whether or not it will be necessary to supply a click or guide track. A dance or rock track with a strong drum part effectively has a click already, but a piano ballad, for example, might be based around the ebb and flow of the performance, and that can be difficult for a section to follow without a more obvious guide. Alongside his career arranging for pop tracks, Nick works as an orchestral arranger and conductor for film scores. Here, he explains where the differences lie. “The film business is very tricky because right until the last minute films are being edited quite drastically, and if the composer is working — as mostly they are — to cues that are very precise, and the edit is screwed around with, then suddenly what’s written is wrong. That’s where the music editor comes in, because they are constantly updating the composer with the latest versions. They are a link between the composer, director or film editor, and are very crucial to that process. “And then I come in and turn the composer’s approximate ideas, mostly presented as electronic demos, into reality. The demos are usually very good and precise, making use of string libraries and a whole bunch of stuff that’s out there.